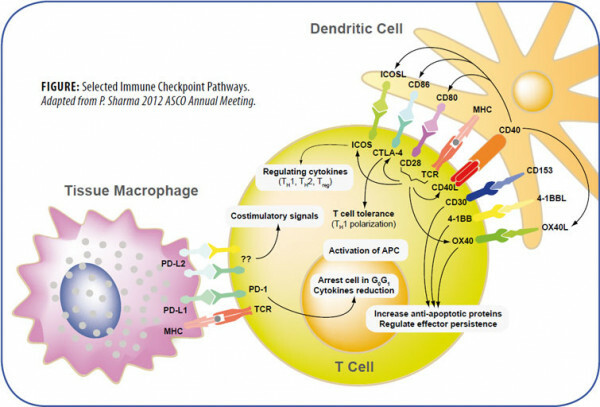 The amplitude and quality of the immune response of T cells is controlled by an equilibrium between costimulatory and inhibitory signals, called immune checkpoints. Under normal physiological conditions, immune checkpoints are crucial for the maintenance of self-tolerance and to protect tissues from damage during pathogenic infection. Manipulations of the inhibitory immune checkpoints using monoclonal antibodies or soluble receptors may provide therapeutic strategies for autoimmune diseases, tumor growth, infectious diseases and transplantation by enhancing T cell activity. CTLA-4 (Cytotoxic T Lymphocyte Antigen-4) shares sequence homology and ligands (CD80/B7-1 or CD86/B7-2) with the costimulatory molecule CD28, but differs by delivering inhibitory signals to the T cells on which it is expressed as a receptor. PD-1 (Programmed Cell Death Protein-1) is a negative costimulatory molecule with two ligands, PD-L1 (also known as B7-H1; CD274) and PD-L2 (B7-DC; CD273). 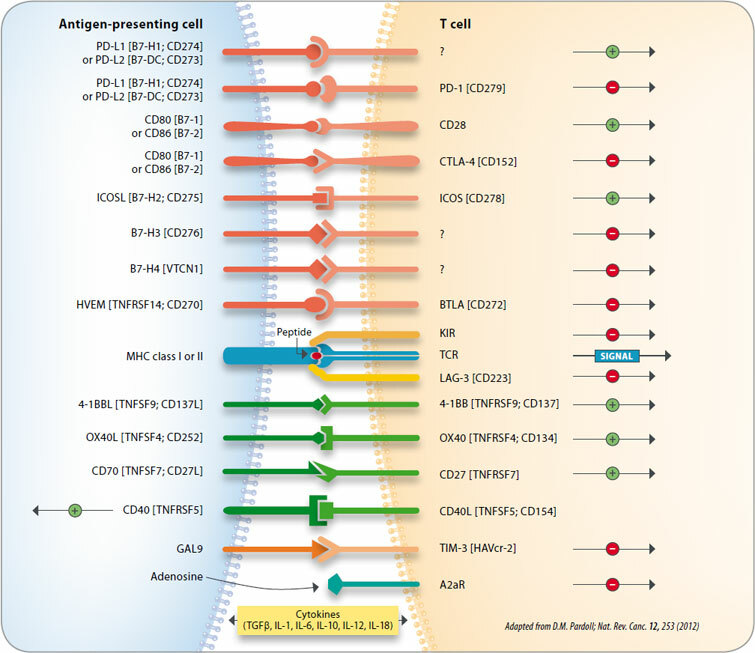 Antagonistic monoclonal antibodies to CTLA-4 or PD-1 and soluble CTLA- 4 or PD-1 receptors fused to the Fc region of immunoglobulin (Ig) are used for the enhancement of T cell cytotoxicity against tumor cells. LAG-3 (Lymphocyte Activation Gene-3 Protein) is a CD4-like negative regulatory protein with a high affinity binding to MHC Class II that leads to tolerance of T cell proliferation and homeostasis. Blockade of the LAG-3/Class II interaction using a LAG-3-Ig fusion protein enhances antitumor immune responses. Combinatorial blockade of PD-1 and LAG-3 synergistically reduces the growth of established tumors. In addition, blockade of other inhibitory receptors, such as BTLA (B- and T-lymphocyte attenuator), KIR (killer immunoglobulin-like receptors), TIM-3 (T cell immunoglobulin and mucin domain-containing protein 3), A2aR (adenosine 2A receptor), B7-H3 or H4 (B7 family members) either alone or in combination with a second immune checkpoint inhibitor has also been shown to enhance antitumor immunity. Costimulatory signaling proteins such as ICOS (inducible T cell costimulator), CD28 or the TNF family members 4-1BB (CD137), OX40, CD27 or CD40, have been shown to be involved in allergy, autoimmune or inflammatory diseases. Regulation and activation of T lymphocytes depend on signaling by the T cell receptor (TCR) and also by cosignaling receptors that deliver negative (–) or positive (+) signals. The B7 family consists of structurally related, cell-surface protein ligands, which bind to receptors on lymphocytes that regulate immune responses. Activation of T and B lymphocytes is initiated by engagement of cell-surface, antigen-specific T cell or B cell receptors, but additional signals delivered simultaneously by B7 ligands determine the ultimate immune response. These “costimulatory” or “coinhibitory” signals are delivered by B7 ligands through the CD28 family of receptors on lymphocytes, resulting also in the modulation of interleukin production. Interaction of B7-family members with costimulatory receptors augments immune responses and interaction with coinhibitory receptors attenuates immune responses. There are currently seven known members of the B7 family: B7.1 (CD80), B7.2 (CD86), inducible costimulator ligand (ICOS-L), programmed death-1 ligand (PD-L1), programmed death-2 ligand (PD-L2), B7-H3, and B7-H4 and four known members of the CD28 family: CD28, CTLA-4 (CD152), ICOS, PD-1. The importance of the family in regulating immune responses is shown by the development of immunodeficiency and autoimmune diseases. Manipulation of the signals delivered by B7 ligands has shown potential in the treatment of autoimmunity, inflammatory diseases and cancer. The TIM (T cell/transmembrane, immunoglobulin and mucin) family plays a critical role in regulating immune responses, including allergy, asthma, transplant tolerance, autoimmunity and the response to viral infections. The unique structure of TIM immunoglobulin variable region domains allows highly specific recognition of phosphatidylserine (PtdSer), exposed on the surface of apoptotic cells. TIM-1, important for asthma and allergy, is preferentially expressed on T-helper 2 (Th2) cells and functions as a potent costimulatory molecule for T cell activation. TIM-3 is preferentially expressed on Th1 and Tc1 cells and generates an inhibitory signal resulting in apoptosis of Th1 and Tc1 cells. TIM-3 is also expressed on some dendritic cells and can mediate phagocytosis of apoptotic cells and cross-presentation of antigen. TIM-4 is exclusively expressed on antigen-presenting cells, where it mediates phagocytosis of apoptotic cells and plays an important role in maintaining tolerance.